Russian Foreign Minister Sergei Lavrov said on Tuesday that Western calls to hold early elections in Ukraine and threats to impose sanctions are attempts to impose the EU’s will on the country. He called on Western governments to stop supporting extremists. Earlier President Vladimir Putin, in a telephone conversation with the German Chancellor, also demanded an end to pressure on the Ukrainian authorities and asked that she condemn the extremists in Kiev. “Demands are sounding from Western European capitals to give the Ukrainian people freedom of choice – but they quickly add that the choice should be made in favour of Europe, in favour of the European Union,” Lavrov said at a news conference in Baghdad. “The goal in fact is to impose this choice on the Ukrainian leadership. This is evident in the initiatives now being put forward – namely, to hold parliamentary and presidential elections as soon as possible. In other words, Ukraine's choice has already been made for it in the West,” Russia’s Foreign Minister added. Lavrov also said that the West and the Ukrainian opposition should disassociate themselves from extremists and other radicals. “Our position is also that all external players and the Ukrainian opposition must decisively and immediately distance themselves from extremists and other radicals,” he told RIA Novosti. The Russian Foreign Minister also made ​​it clear that the West’s threat to apply sanctions against Ukraine is blackmail and a manifestation of double standards. “The opposition is either unable or unwilling to disassociate themselves from extremists. 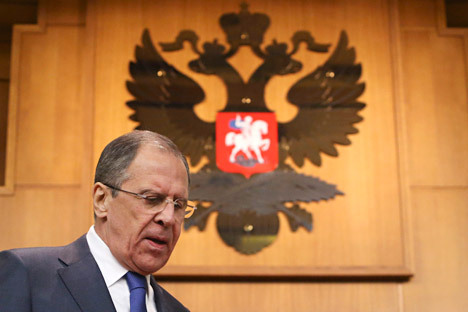 The US is putting all the blame on the Ukrainian authorities - and this is double standards,” said Lavrov. He noted that in fact, American sanctions would encourage militants. “The EU is also trying to discuss imposing sanctions, while an uninvited EU mission has arrived in Ukraine… such actions look like blackmail,” the minister said. Earlier, Russian President Vladimir Putin called on the West to harshly condemn extremists among the opposition in Kiev and stop blaming the Ukrainian authorities. He spoke of this in a phone call to German Chancellor Angela Merkel. “Putin stressed the importance of the Western countries refraining from making accusations against the Ukrainian government, as well as the importance of strongly condemning opposition forces suspected of organizing illegal, extremist and terrorist acts,” said the Kremlin press service. “Putin and Merkel expressed their joint view on the need for urgent action to help stabilize the situation in Ukraine,” noted the Kremlin. Meanwhile, Prime Minister Dmitry Medvedev said that Russia would strive to fulfill all its agreements with Ukraine, but for full cooperation to be possible, the authorities in Ukraine must remain in control of the situation. “Of course, we’ll continue to cooperate with our Ukrainian partners in all the previously agreed areas, and we’ll try to do everything to keep the promises we have made to them. At the same time, it’s vital for these partners to stay in good shape, and for the authorities in Ukraine to be legitimate and effective, and not a doormat for everyone to wipe their feet on,” Medvedev said at a government meeting on February 20.